Guide Gear Teepee Tent 18 x 18. This Guide Gear Teepee Tent 18 x 18 is the largest from this brand, and they have several others 10 x 10, 14 x 14, and 14 x 14 Deluxe version, the numbers denote feet. This brand is well-known for its tipi tents and some of them have been around for many years already. Now, the phrase teepee tent (or tipi tent) is normally used for these modern versions of the traditional teepees but you probably know that those are very different structures. So modern teepees are single-pole constructions and they are not freestanding. The same structure you have here in this tent. What keeps it up is the pole and the staked base, so the first thing to do is to stake it properly and then raise the central pole. It is essential that you choose a ground that keeps the stakes so this cannot be sound, and this also cannot be done on a rock or a frozen terrain. This is also a structure with a fully sewn-in and sealed floor which you can see in the picture below. The number 18 denotes its dimension, this is a polygonal large structure but it is also very tall with the peak height of 118 inches (300 cm). So I have added it to my list of very tall tents. View inside, the door, the pole, and the fully sealed floor. This is a huge tent but one person can easily set it up. Some 15 minutes or so should be quite enough to do the job. Space-wise, they claim the tent is for 10-12 people. Actually, the area is not given but my estimate is that it is in the range 230 – 237 ft² (21 – 22 m²). I have added it to my list of best 12-person tents. In the case of 12 users, this would give at least 19.2 ft² (1.75 m²) per person, and this looks enough in the case of a group of friends on a summer open-air concert. For camping, it is best to downgrade this by half. In view of such a size, I have included it in my list of extra large family camping tents. 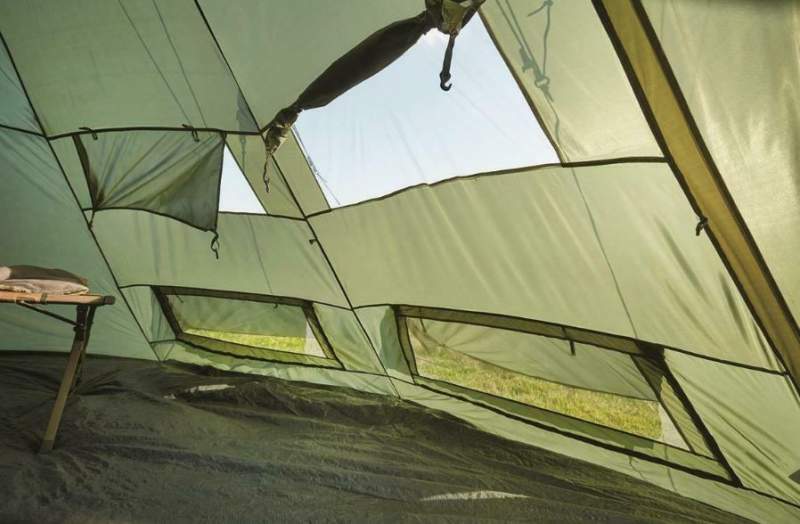 Climate-wise & seasons-wise, as a single-layer construction this tent relies on vents and you have them enough. The windows are solid and you can close all the openings with panels. I see it better suited for a cooler than for a warm environment. 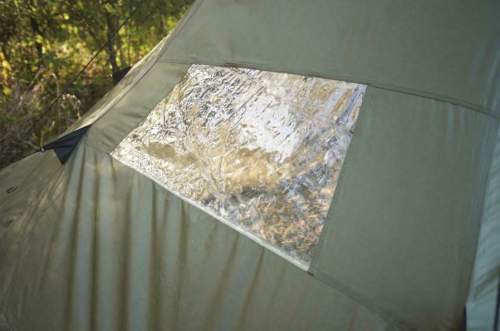 But the waterproof rating is rather low, the tent is very tall, so it is best to avoid rain and strong winds. 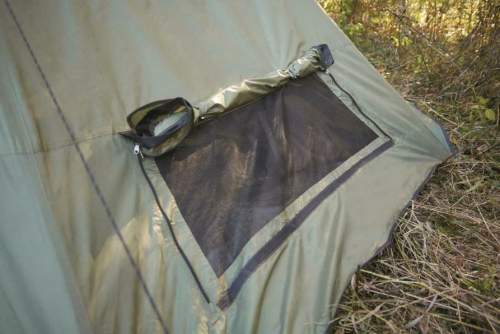 Weight-wise, for such a big construction this is a lightweight tent with its 23.15 lb (10.5 kg). Note also that the packed size 32.3 x 10.2 x 9.8 inches (82 x 26 x 25 cm) is very good but you need a car for transportation. This is a single-room structure with 4 solid windows. But the vents are such that they can serve as windows as well. The door and vents are with mesh and panels. The solid windows have inner blinds for privacy, and they are equipped with toggles, you can see this in the picture below. The solid windows are with internal shutters, and mesh vents are with external panels. 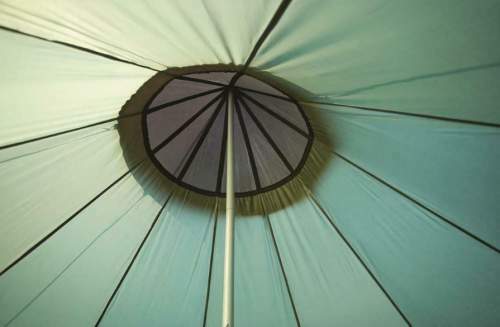 There is one thick steel shock-corded pole with 28 mm diameter, and the tent also comes with 28 stakes used for the base, for vents wires, and for guy-wires. Note that there is a plastic base for the pole so that it doe snot damage the floor. The tent body is a 190D polyester which is quite a durable material, and the waterproof rating is 1000 mm. The floor is a sewn-in polyethylene, sturdy and waterproof. The seams are factory-sealed but I have seen many users complaining about leaking. You have #8, #5 zippers on the doors and on the vents, respectively. The carry bag is included. There are 4 low vents that are nicely designed so that you can stake them out with panels and this you can use when it is raining or for privacy. When the sky is clear, you can roll the panels up and fix above the vents. The mesh will give a complete protection from insects. Both configurations are shown in the pictures below. 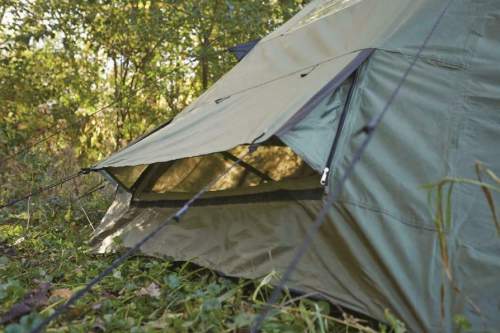 Note that you have zippers on the flaps, which is a great feature for such an affordable tent. There is also a top vent shown in the picture above, it is with mesh so you are again protected from insects, see the picture above. There is a top fly which protects this vent from the rain. Here, the vent panel is rolled up. Here the vent panel is staked out for the rain configuration. Declared capacity: 10 – 12 people. Weight: 23.15 lb (10.5 kg). Dimensions: 18 x 18 ft (549 x 549 cm). Area: 230 – 237 ft² (21 – 22 m²). Area per person (12 users): 19.2 ft² (1.75 m²). Peak height: 118 in (300 cm). Packed size: 32.3 x 10.2 x 9.8 in (82 x 26 x 25 cm). I give this teepee side by side with two smaller teepees, so you can get some idea of how much space you can get with some extra weight and extra height. Obviously, it is much taller and bigger than the other two, though it is heavier, but it is equally affordable. 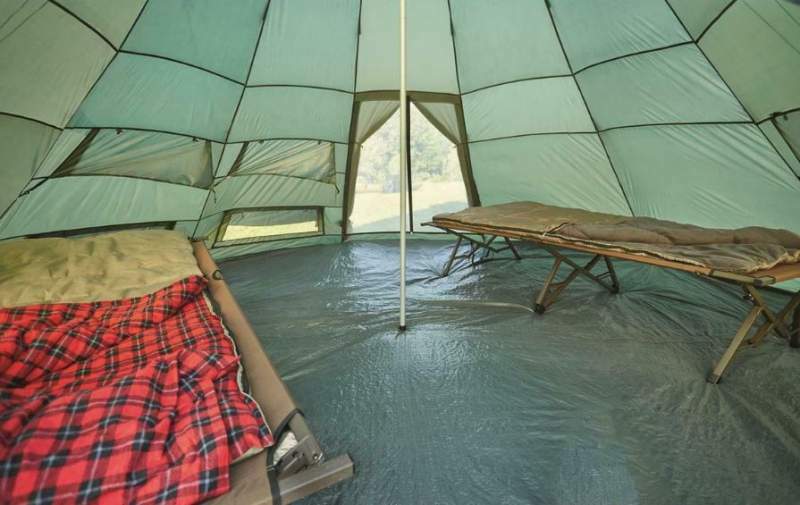 This Guide Gear Teepee Tent 18×18 offers lots of area for the declared number of users, it is very pleasant with its solid windows and numerous vents. The setup is easy, the packed size and weight are excellent. But do not put it to harsh tests, it is too tall for windy conditions. Overall, this is a great family camping tent for occasional use and a great option if you are on a budget. Note that they have also 18 x 18 Deluxe version. 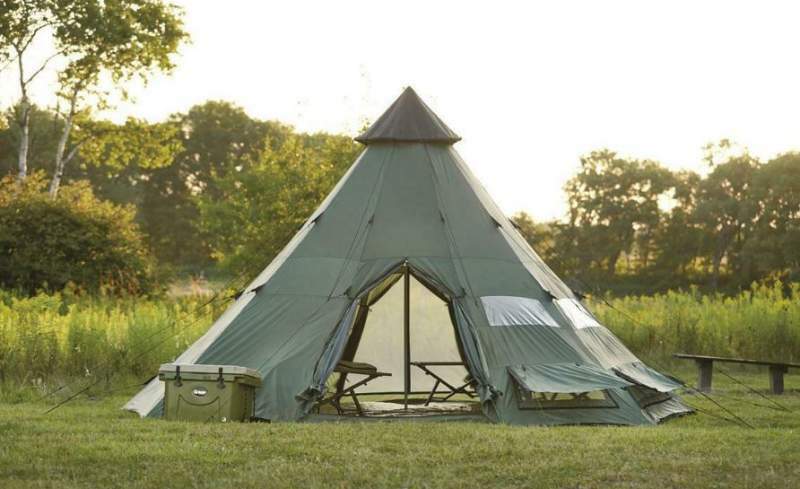 I have added this tent to my list with best teepee tents for camping. This teepee is very similar to the Tahoe Gear Bighorn XL 12 teepee so have a look and compare the two. If you need something different for 12 people, check in the category tents for 11 people plus, you will find them in all sizes and shapes. Please note that this is not a sponsored text and I have no relation with this brand. There is a comment box below so do use it in the case of questions or comments.